Our range of Magic Instant Heating Pad are the modern day hot bags which, need not be plugged in, preheated or filled with hot water. These products are facilitated with a safe preset temperature and shock resistant attribute. Our products are re-usable and available in variety of colors, sizes and shapes. The range of products offered by us find application in treatment of sports injuries, arthritis pain, hypothermia, sprains and Reynolds Syndrome. Moreover, our products are portable in nature and therefore can also be used while fishing, hiking, camping, kayaking, hunting, scuba diving, skiing, working, watching outdoor events, curling, wind surfing, snow boarding, walking or during any outdoor activity when it's cold in order to keep yourself warm. These products can be used as hand, foot, plate, battery, shoulder, lower back or baby bottle warmer and these will instantly heat our products at safe preset temperature of 130º F / 54º C.
To Activate: Press the metal disk which is inside the liquid of our Instant Heating Pad to activate these products. To Recharge: Keep the Instant Heating Pad wrapped in a cloth and place it in boiling water for 5-7mins. till the crystals are dissolved. In case any crystal is left, continue boiling. This avoids re-solidification of crystals. Once these are completely cleared, these can be used twice. First, after boiling and next after cooling. After these products cool down these can be re-activated by clicking on the chip inside the liquid. 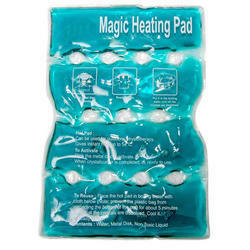 Our range of Magic Heat Pad are the modern day hot bags which, need not be plugged in, preheated or filled with hot water. These products are facilitated with a safe preset temperature and shock resistant attribute. Our products are re-usable and available in variety of colors, sizes and shapes. The range of products offered by us find application in treatment of sports injuries, arthritis pain, hypothermia, sprains and Reynolds Syndrome. Moreover, our products are portable in nature and therefore can also be used while fishing, hiking, camping, kayaking, hunting, scuba diving, skiing, working, watching outdoor events, curling, wind surfing, snow boarding, walking or during any outdoor activity when it's cold in order to keep yourself warm. These products can be used as hand, foot, plate, battery, shoulder, lower back or baby bottle warmer and these will instantly heat our products at safe preset temperature of 130º F / 54º C.
To Activate: Press the metal disk which is inside the liquid of our Back Pain Gel Heating Pad to activate these products. To Recharge: Keep the Back Pain Gel Heating Pad wrapped in a cloth and place it in boiling water for 5-7mins. till the crystals are dissolved. In case any crystal is left, continue boiling. This avoids re-solidification of crystals. Once these are completely cleared, these can be used twice. Our range of Magic Knee Heating Padare the modern day hot bags which, need not be plugged in, preheated or filled with hot water. These products are facilitated with a safe preset temperature and shock resistant attribute. Our products are re-usable and available in variety of colors, sizes and shapes. The range of products offered by us find application in treatment of sports injuries, arthritis pain, hypothermia, sprains and Reynolds Syndrome. Moreover, our products are portable in nature and therefore can also be used while fishing, hiking, camping, kayaking, hunting, scuba diving, skiing, working, watching outdoor events, curling, wind surfing, snow boarding, walking or during any outdoor activity when it's cold in order to keep yourself warm. These products can be used as hand, foot, plate, battery, shoulder, lower back or baby bottle warmer and these will instantly heat our products at safe preset temperature of 130º F / 54º C.
Hand Warmer Hand Warmer offered comprises sodium acetate solution from inside as well as PVC finish from outside so as to provide for reliable and consistent usage. We can offer these in options of different finish colors and support the need of heat therapy for relief of pain and back strain. Some of its features include provide for perfect warming support; allows for instant heat up to approximate 52 °C; can be reused; durable construction finish; choice of OEM construction. Our range of Magic Gel Padare the modern day hot bags which, need not be plugged in, preheated or filled with hot water. These products are facilitated with a safe preset temperature and shock resistant attribute. Our products are re-usable and available in variety of colors, sizes and shapes. The range of products offered by us find application in treatment of sports injuries, arthritis pain, hypothermia, sprains and Reynolds Syndrome. Moreover, our products are portable in nature and therefore can also be used while fishing, hiking, camping, kayaking, hunting, scuba diving, skiing, working, watching outdoor events, curling, wind surfing, snow boarding, walking or during any outdoor activity when it's cold in order to keep yourself warm. These products can be used as hand, foot, plate, battery, shoulder, lower back or baby bottle warmer and these will instantly heat our products at safe preset temperature of 130º F / 54º C.
To Generate Heat Press the metal disc front and back inside of the liquid of the hot pad. Allow it to cool down to room temperature before using. Repeat the above procedure to use it again and again. Firmly but gently depress and release the Activator Button. Allow 15 seconds for heat to spread throughout the pack. Quickly squeeze pack until soft and pliable for maximum heat. Wrap eat pad in cloth OR place in a saucer or wire rack in the bottom of a pot filled with water to protect against direct contact. Heat the pad submerged in a bowl of water for a minimum of 10 minutes disappear, leaving behind the clear liquid. Cool to room temperature before reusing. Our range of Magic Heating Padare the modern day hot bags which, need not be plugged in, preheated or filled with hot water. These products are facilitated with a safe preset temperature and shock resistant attribute. Our products are re-usable and available in variety of colors, sizes and shapes. The range of products offered by us find application in treatment of sports injuries, arthritis pain, hypothermia, sprains and Reynolds Syndrome. Moreover, our products are portable in nature and therefore can also be used while fishing, hiking, camping, kayaking, hunting, scuba diving, skiing, working, watching outdoor events, curling, wind surfing, snow boarding, walking or during any outdoor activity when it's cold in order to keep yourself warm. These products can be used as hand, foot, plate, battery, shoulder, lower back or baby bottle warmer and these will instantly heat our products at safe preset temperature of 130º F / 54º C.
Our range of Magic Hot Padare the modern day hot bags which, need not be plugged in, preheated or filled with hot water. These products are facilitated with a safe preset temperature and shock resistant attribute. Our products are re-usable and available in variety of colors, sizes and shapes. The range of products offered by us find application in treatment of sports injuries, arthritis pain, hypothermia, sprains and Reynolds Syndrome. Moreover, our products are portable in nature and therefore can also be used while fishing, hiking, camping, kayaking, hunting, scuba diving, skiing, working, watching outdoor events, curling, wind surfing, snow boarding, walking or during any outdoor activity when it's cold in order to keep yourself warm. These products can be used as hand, foot, plate, battery, shoulder, lower back or baby bottle warmer and these will instantly heat our products at safe preset temperature of 130º F / 54º C.
Our range of Reusable Magic Gel Heating Padare the modern day hot bags which, need not be plugged in, preheated or filled with hot water. These products are facilitated with a safe preset temperature and shock resistant attribute. Our products are re-usable and available in variety of colors, sizes and shapes. The range of products offered by us find application in treatment of sports injuries, arthritis pain, hypothermia, sprains and Reynolds Syndrome. Moreover, our products are portable in nature and therefore can also be used while fishing, hiking, camping, kayaking, hunting, scuba diving, skiing, working, watching outdoor events, curling, wind surfing, snow boarding, walking or during any outdoor activity when it's cold in order to keep yourself warm. 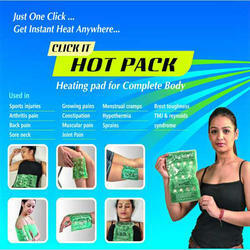 These products can be used as hand, foot, plate, battery, shoulder, lower back or baby bottle warmer and these will instantly heat our products at safe preset temperature of 130º F / 54º C.
Our range of Magic Gel Heating Pads are the modern day hot bags which, need not be plugged in, preheated or filled with hot water. These products are facilitated with a safe preset temperature and shock resistant attribute. Our products are re-usable and available in variety of colors, sizes and shapes. The range of products offered by us find application in treatment of sports injuries, arthritis pain, hypothermia, sprains and Reynolds Syndrome. Moreover, our products are portable in nature and therefore can also be used while fishing, hiking, camping, kayaking, hunting, scuba diving, skiing, working, watching outdoor events, curling, wind surfing, snow boarding, walking or during any outdoor activity when it's cold in order to keep yourself warm. These products can be used as hand, foot, plate, battery, shoulder, lower back or baby bottle warmer and these will instantly heat our products at safe preset temperature of 130º F / 54º C.
To Activate: Press the metal disk which is inside the liquid of our MAGIC HEAT PADS to activate these products. To Recharge: Keep the magic heat pad wrapped in a cloth and place it in boiling water for 15-20mins. till the crystals are dissolved. In case any crystal is left, continue boiling. This avoids re-solidification of crystals. Once these are completely cleared, these can be used twice. Our range of Magic Neck Heating Padare the modern day hot bags which, need not be plugged in, preheated or filled with hot water. These products are facilitated with a safe preset temperature and shock resistant attribute. Our products are re-usable and available in variety of colors, sizes and shapes. The range of products offered by us find application in treatment of sports injuries, arthritis pain, hypothermia, sprains and Reynolds Syndrome. Moreover, our products are portable in nature and therefore can also be used while fishing, hiking, camping, kayaking, hunting, scuba diving, skiing, working, watching outdoor events, curling, wind surfing, snow boarding, walking or during any outdoor activity when it's cold in order to keep yourself warm. These products can be used as hand, foot, plate, battery, shoulder, lower back or baby bottle warmer and these will instantly heat our products at safe preset temperature of 130º F / 54º C.
Heat therapy has been a natural remedy used in both to relieve pain and enhance the recovery process. By increasing the temperature of the skin surface and underlying tissues, heat stimulates the thermal receptors-sensory receptors that respond to heat and cold which then help block transmissions of pain signals to the brain. This translates into a significant decrease in discomfort. Heat therapy increases blood flow, which helps to decrease stiffness, relaxes sore muscles, and provides soothing comfort. Heat should not be used on areas of swelling and bruising. (If swelling occurs, use cool pad, then apply heat after the swelling goes away). This heating pad that doesn't have to be plugged in, reheated or microwaved. A heat pack that heats to a safe preset temperature and is completely reusable. If any crystal is still left out, continue to boil again to avoid re-crystallization. 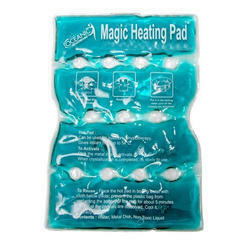 When magic gel heating pad is completely clear, it can use two times. First just after boiling and second when it cools. 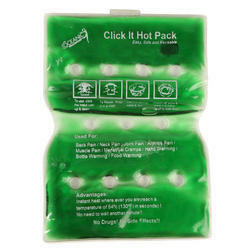 Our Incredible click it hot packs ( Reusable Magic Gel Heating Pad ) can be used for: Treatment of sports injuries Arthritis pain Back pain Sore neck Menstrual cramps Toothaches Hypothermia Sprains Growing pains TMJ Reynolds syndrome Brest toughness Joint pain Muscular pain Magic Gel Heating Pad generates heat instantly up to 130º F/54º C temperature. 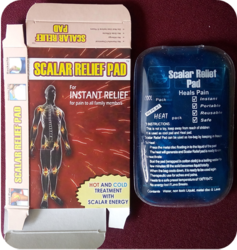 We are providing a wide range of Scalar Relief Energy Pad utilizes specialized quantum physics, geometry and vibration harnessing technologies. In modern times, Scalar Energy is required to fight against the impact of harmful electromagnetic waves. These pendants are provided as per the needs of the clients. To Activate: Press metal disk floating in side the liquid of the range of magic heat pads to generate heat. 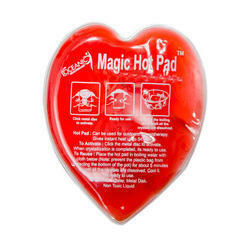 To Recharge: Put the range of MAGIC HEAT PADS wrapped in a thin cloth and place it in boiling water for 5 to 7 min. till all crystals dissolve properly. If any crystal is still left out, continue to boil again to avoid re-solidifying of the crystals. 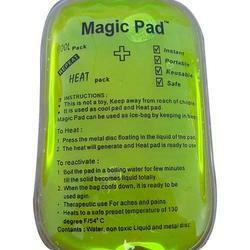 When range of magic heat pads is completely clear, it can be use two times. First just after boiling and second when it,s cools. 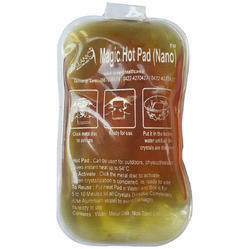 After range of magic heat pad’s cool down, it can be re-activated for further use by clicking chip in side the liquid. Caution: This is not a toy, keep out of reach of children. Our range of Magic Heat Padare the modern day hot bags which, need not be plugged in, preheated or filled with hot water. These products are facilitated with a safe preset temperature and shock resistant attribute. Our products are re-usable and available in variety of colors, sizes and shapes. The range of products offered by us find application in treatment of sports injuries, arthritis pain, hypothermia, sprains and Reynolds Syndrome. Moreover, our products are portable in nature and therefore can also be used while fishing, hiking, camping, kayaking, hunting, scuba diving, skiing, working, watching outdoor events, curling, wind surfing, snow boarding, walking or during any outdoor activity when it's cold in order to keep yourself warm. These products can be used as hand, foot, plate, battery, shoulder, lower back or baby bottle warmer and these will instantly heat our products at safe preset temperature of 130º F / 54º C.
Our range of Magic Heating Bagare the modern day hot bags which, need not be plugged in, preheated or filled with hot water. These products are facilitated with a safe preset temperature and shock resistant attribute. Our products are re-usable and available in variety of colors, sizes and shapes. The range of products offered by us find application in treatment of sports injuries, arthritis pain, hypothermia, sprains and Reynolds Syndrome. Moreover, our products are portable in nature and therefore can also be used while fishing, hiking, camping, kayaking, hunting, scuba diving, skiing, working, watching outdoor events, curling, wind surfing, snow boarding, walking or during any outdoor activity when it's cold in order to keep yourself warm. These products can be used as hand, foot, plate, battery, shoulder, lower back or baby bottle warmer and these will instantly heat our products at safe preset temperature of 130º F / 54º C.
Which increases blood flow and supplies oxygen and nutrients to reduce pain. Press the metal disc front and back inside of the liquid of the Heating pad . Allow it to cool down to room temperature before using. Repeat the above procedure to use it again and again. Both to relieve pain and enhance the recovery process. Which then help block transmissions of pain signals to the brain. This translates into a significant decrease in discomfort. Firmly but gently depress and release the activator button”. Allow 15 seconds for heat to spread throughout pack. Wrap heat pad in cloth or place in a saucer or wire rack in bottom of pot filled with water to protect against direct contact. Cool to room temperature before re-using.